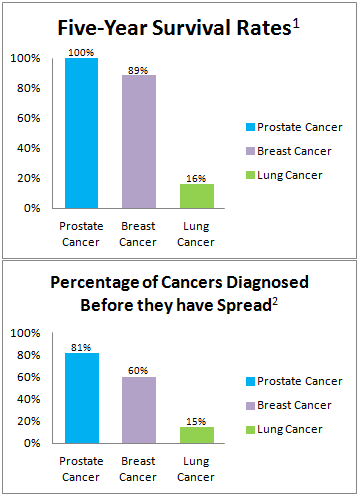 Download our Lung Cancer Facts Infographic! In North Carolina, around 8,490 people are diagnosed with lung cancer, and more than 5,770 are expected to die this year. American Cancer Society. Cancer Facts and Figures 2018. Atlanta: American Cancer Society; 2018. Burns DM. Primary Prevention, smoking, and smoking cessation: Implications for future trends in lung cancer prevention. Cancer, 2000. 89:2506-2509. Thun, MJ, et al. Lung Cancer Occurrence in Never-Smokers: An Analysis of 13 Cohorts and 22 Cancer Registry Studies. PLOS Medicine, 2008. 5(9): e185. Doi: 10.1371/journal/pmed.0050185. Satcher, D, Thompson, TG and Kaplan, JP. Women and smoking: a report of the Surgeon General. Nicotine Tob Res, 2002. 4(1): 7-20.? Park et al. 2012: http://onlinelibrary.wiley.com/doi/10.1002/cncr.26545/abstract.